The first shoe dropped on Eddie MacDonald in the second practice for the Busch North Series Fisher Snow Plows 150 at Oxford Plains when the engine quit. 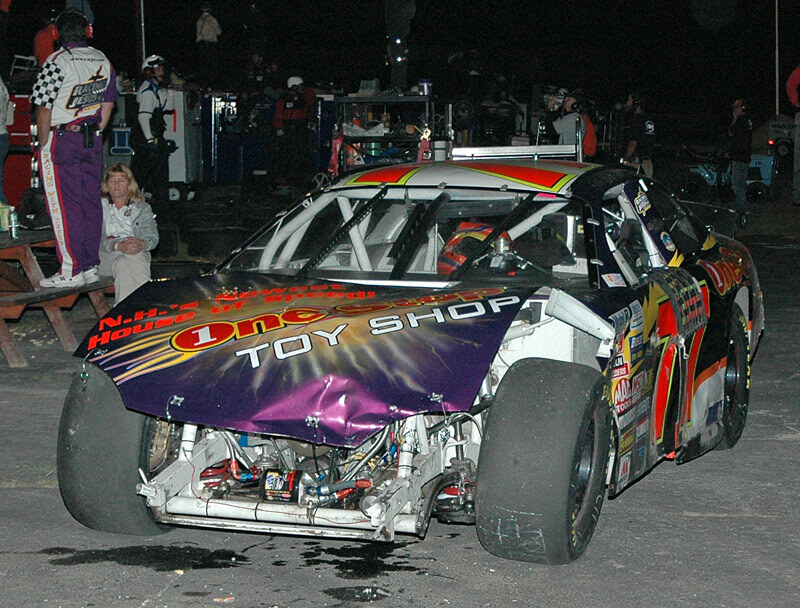 The next shoe fell on lap 92 when the One Stop Toy Shop Chevy crashed into a spinning Kelly Moore ending his night with heavy front-end damage to finish 21st. MacDonald was third fastest in the first practice and the engine showed no signs of any problems but just three laps into the second practice the Rowley, Mass. driver felt the engine just tighten up and shut it down immediately but the damage was done. The crew jumped into action and over the next two hours they did yeoman’s work in changing engines. While part of the crew removed the power plant from the back-up car, the remaining team lifted out the broken motor. Soon afterwards, the engine was installed and running well before race time. 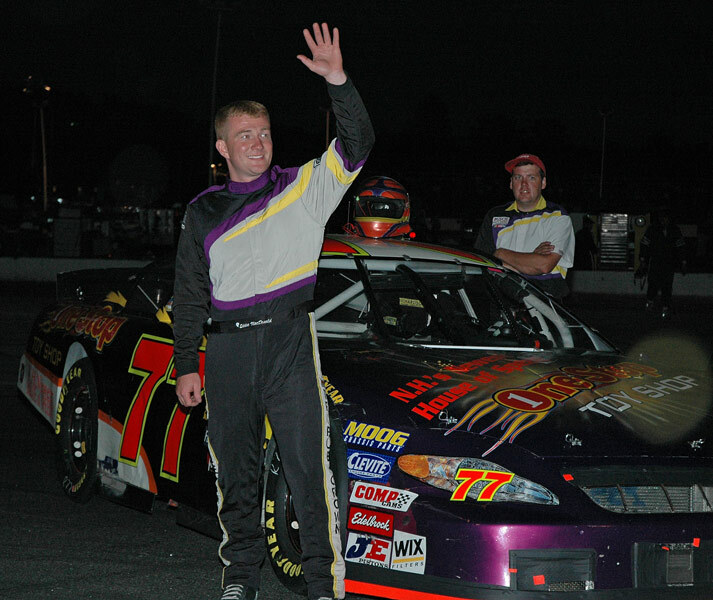 The engine change bumped MacDonald from qualifying and he started tail end of the field in the 24th position. With no practice with the new engine, MacDonald and crew chief Rollie LaChance decided to run the first few laps easy to see how the car handled and if all went well to then start moving towards the front, passing one car at a time. The car responded well and was able to pass a number of cars in the first 15 laps. “I was real happy with the car and it really responded well. 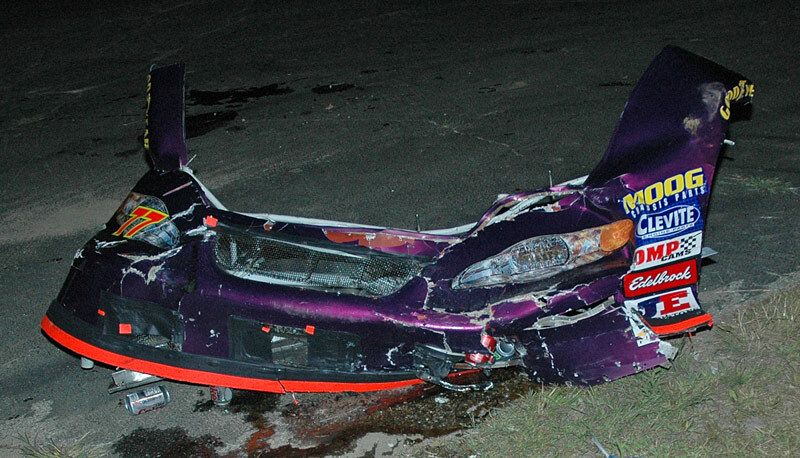 Even though it was a little loose I was still able to drive it where it need to be to move up,” said MacDonald. When the caution flag waved on lap 27, the #77 was in 14th place and after Johnson’s spin on lap 31, MacDonald had moved into the 11th spot. The field ran nose to tail until a lap 55 caution with some of the leaders making pit stops. On the lap 63 restart, MacDonald had the sixth position and was waiting for the next caution in order to pit. Unfortunately, he was involved in the next one on lap 92. “I was coming up through the pack real good and we were just waiting it out hoping that we would get a caution real soon. We were going to pit for tires then get back out there to run on the outside because the inside line was backed right up, but I think the car was good enough to go on the outside and pass some people. All day long we were good and it stayed that way right up until the end,” said MacDonald after the race. Look for the One Stop Toy Shop Chevy to be ready for the Sylvania 125 at New Hampshire International Speedway on Friday, September 16.